Spring Mountain ski area is located in Spring Mount, Pennsylvania, just minutes from the Lansdale exit on the Pennsylvania Turnpike. It is a small ski area, but perfect for families who want to get some time on the slopes, and an excellent place for beginners and intermediate skiers and snowboarders to learn and improve on their skills. Less than an hour's drive (about 30 miles) from Philadelphia, there is a little something here for everyone in the family, including a terrain park, a half pipe, tubing runs, and trails that range from beginner to expert. Spring Mountain has been in operation since 1963 and continues to be the most affordable family ski area for the Philadelphia area. Sitting at 528 feet above sea level on a plateau in Western Montgomery County, this diminutive collection of slopes doesn't stop when the sun goes down. All of the trails are open for night skiing. With just a few feet of natural snowfall per year, the mountain relies mostly on snowmaking equipment to cover the slopes, which means that skiers and snowboarders can enjoy the sport throughout the spring. Because Spring Mountain is such a beginner-friendly ski area, it is the perfect spot to learn how to ski. They offer both beginner and intermediate lessons, with a particular concentration on beginners, kids and adults alike. For those just learning how to ski, the mountain offers a beginner learning area called Mole Hill, which provides gentle terrain that is separate from the main slope. The hill has its own Magic Carpet, an escalator-style conveyor belt that is simple to load off and on. 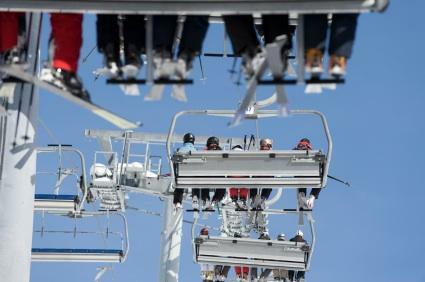 It is perfect for those who are not yet ready to master the chairlift. Snowboarders have their own lesson program called the Burton Learn To Ride Program for Adults and Kids, which was developed by Burton in 1998 to make the learning process easy and fun. The program uses a proven method, as well as Burton equipment that is created with beginners in mind. Small classes ensure that everyone in the group has a personalized experience. Springmount Cafe: Offers a range of items such as cold sandwiches, cheese steaks, pulled pork, funnel cakes, pizza, burgers, chef salad, soups and chili. Alpine Restaurant: Provides a breakfast and lunch menu with breathtaking views of the mountain. A breakfast buffet is served Saturdays and Sundays. The rest of the week the menu is a la carte with options such as breakfast sandwiches, french toast, sausage gravy over toast, pancakes and more. Justa Pizza: Delicious pizza served mountainside. There are several lodging options for Spring Mountain, all of which are clean and comfortable and just minutes from the ski area.